The Nuclear AMRC works with companies to overcome their manufacturing problems, and help them develop the technical capability to compete on cost, quality and delivery. Our resources and capabilities have been determined by our industry partners, with the aim of helping suppliers reduce cost, improve quality, reduce lead time and cycle time, and reduce risk in manufacturing. You can access our capabilities through company-led commercial R&D projects, or by joining collaborative R&D programmes supported by third-party funding. Our research factory on the Advanced Manufacturing Park in South Yorkshire is based around a 5,000 sq m open-plan workshop, staffed by more than 80 experienced manufacturing engineers and operators. Our workshop is designed for working on production-scale technology demonstrators, and hosts over £35 million worth of state-of-the-art manufacturing equipment. Many of our machining centres and welding cells feature unique capabilities, or are the largest or most powerful of their kind available for independent industrial research anywhere in the world. Modularisation R&D is based at the Nuclear AMRC Birkenhead facility, at the site of our member Cammell Laird. We are also developing our capabilities in new technology areas including control & instrumentation and equipment qualification at the new Nuclear AMRC Midlands facility in Derby. The capabilities of our workshop are matched by the expertise of our team. You can draw on the knowledge and skills of more than 80 experienced manufacturing engineers and operators, with over 1,000 person-years of practical experience. Our engineers have proven experience of working with companies in long-term collaborations to significantly reduce costs and lead times. We have also completed hundreds of shorter projects with a host of companies to investigate new processes, resolve current process problems, and tackle large-scale manufacturing challenges in a variety of sectors. We play a key role in the continuing development of the UK nuclear sector. Developing advanced manufacturing processes for nuclear applications and embedding them in the supply chain is vital to increasing UK manufacturing productivity and reducing risk in the nuclear programme. Our research aims to help UK manufacturers compete globally, increasing high-value jobs, export orders and GDP for the benefit of all. We are at the forefront of new technology areas such as advanced modular reactors (AMRs) and small modular reactors (SMRs), and are working with all the major reactor vendors targeting UK development. We also work closely with the Nuclear Decommissioning Authority and its site licence companies to improve manufacturing for the clean-up of the UK’s nuclear legacy sites. 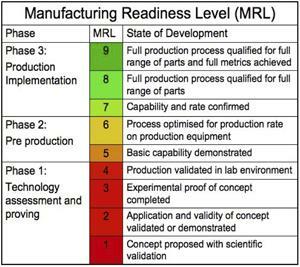 Our research spans the challenging middle stages of the Manufacturing Readiness Level (MRL) scale, taking new manufacturing technologies and processes from proof of concept towards production readiness. Our core focus is on MRL3-6, where we progress innovative processes from a laboratory scale to demonstration on representative-sized components (at least two-thirds of actual size). We can exploit and customise a wide range of technologies for new applications, delivering significant manufacturing improvements and technology advantages with minimum risk and no loss of production time in your own factory. Our equipment has been selected to meet the machining, fabrication and assembly requirements of the civil nuclear sector. Their capabilities can also be used to address problems in large-scale manufacturing across the energy sector and in other high-value industries. Machining technologies – new and optimised processes for the machining of large and complex components. Joining technologies – mechanised welding and solid-state bonding methods, including arc, power beam and diffusion bonding techniques. Additive manufacturing and near-net shape forming – high-integrity production and customisation of large metal components. Automation and digitalisation – robotics, artificial intelligence and data-driven manufacturing to improve productivity and develop new capabilities. Controls and instrumentation – digital sensors, instruments and safety systems for nuclear power plants and other industries. Materials, corrosion and thermal engineering – enhanced material characteristics and performance in reactors and other extreme environments. Analysis and simulation – high-fidelity data-driven models for processing and materials optimisation, plant construction and operations. Product and process verification – developing high-quality structural integrity data for performance models and through-life maintenance forecasts. Codes and standards – ensuring innovative manufacturing techniques meet relevant industry standards. The University of Manchester’s Dalton Nuclear Institute provides additional manufacturing, testing and analytical facilities – for more information, visit the Manufacturing Technology Research Laboratory. As well as company-led commercial research, we lead or partner in externally-funded collaborative research projects including those supported by Innovate UK, EPSRC and European Horizon 2020 programme. To find out more about our R&D capabilities, contact Steve Jones, Nuclear AMRC chief technology officer.